Beautiful, ethereal, magical – the superlatives used to describe glass artworks often reach epic and even otherworldly proportions, yet as an art form glass has long been relegated to the category of craft or mere decoration. In 2009 on the island of Murano, Adriano Berengo sought to challenge both notions. Through Fondazione Berengo, he invited artists from around the world who do not typically work in glass to create new works in Berengo Studio, working alongside the historic furnaces master glassmakers. The resulting Glasstress exhibition, which presents dozens of experimental glass works that defy traditional labels, has been produced four times in conjunction with the Venice Biennale. The Boca Raton Museum of Art was proud to present 42 works by 33 artists living or working in 23 countries in Glasstress Boca Raton. “Glasstress challenges our notion of glass as a beautiful material and encourages us to explore the bold, political, and sometimes less than pristine aspects of the medium”, Curator of Contemporary Art Kathleen Goncharov says. From Chinese artist Song Dong‘s surveillance camera chandelier, entitled “Glass Big Brother”, to British artist Luke Jerram‘s delicately modelled viruses from his “Glass Microbiology” series, the themes of the exhibition immediately depart from the levity of decorative art and tackle substantial global issues of politics and diseases. In “Colonne Coloniale”, Cameroonian artist Pascale Marthine Tayou (who now lives and works in Belgium) addresses colonialism and its consequences with glass reproductions of tourist tchotchkes surrounding a tower of kitchen pans decorated with Dutch motifs. Lucy & Jorge Orta, who live and work in France but originate, respectively, from the UK and Argentina, employ colorful and delicate blooms in “Perpetual Amazonia: Tree of Life” to highlight environmental threats in the Peruvian Amazon. Together, these artists and dozens more delve into a myriad of social and scientific challenges as they explore the reaches of glass as a medium. In addition, the Boca Raton Museum of Art commissioned a new work by South Florida artist Carol Prusa that was created on Murano and premiered in Glasstress Boca Raton. Her glass sculpture is titled “Spooky Action”, and it exemplifies the goals of this innovative contemporary art project by using a centuries-old extraordinary and noble material in a modern illusionistic manner that only glass can deliver. “We are undertaking a new curatorial initiative to examine areas traditionally considered craft, but which present alternative mediums of increasing interest to contemporary artists, – Executive Director Irvin Lippman says – Glasstress has excelled in encouraging innovation in both concept and technique, and we are proud to bring this work to the United States on this scale”. Glasstress Boca Raton opened with a Carnevale di Venezia celebration at the Boca Raton Museum of Art on Saturday, January 28, 2017. The exhibition was complemented by a full schedule of educational programs and events. 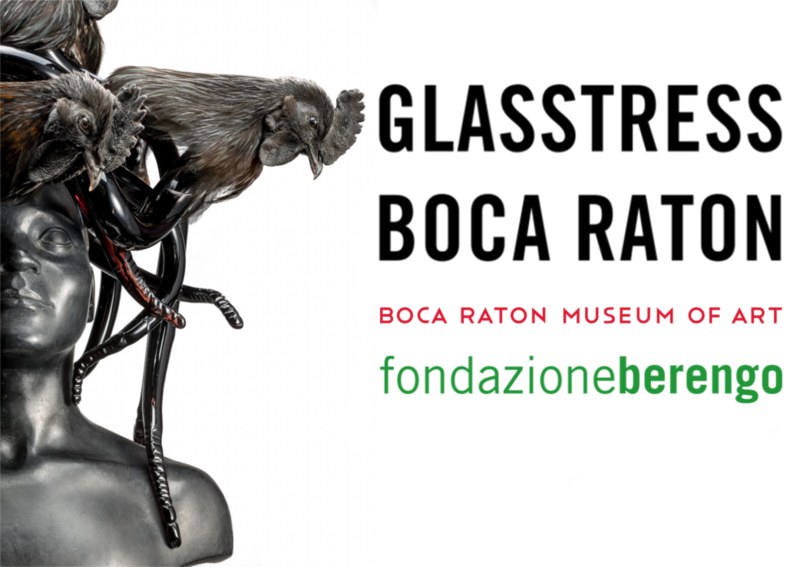 Glasstress Boca Raton was presented in conjunction with Fondazione Berengo and is made possible by the Museum’s Exhibition Leadership Fund with major support generously provided by the Estate of Ardele L. Garrod, the Estate of Ruth Feigl, Jody H. & Martin Grass, Dalia & Duane Stiller, Christine & Peter Raimondi, Steinberg Global Asset Management, Ltd., Art Alliance of Contemporary Glass, Peg Anderson, the George & Frances Armour Foundation, Deon Bezaguet & Claude Prozinski, Tricia & Kevin Cooper, Francis Feeney & Arina Heath, Margie & Merle Horowitz, Irvin Lippman & Bill Harkins, Asa & Per-Olof Loof, Paola Luptak & Markus Jakobson, Tammy & Richard Morgenstern, Florence Paley, Susan Resneck Pierce, Linda H. Sandelman, Trish Savides, Dr. Wilma B. Siegel, and the Museum’s Friends Auxiliary. Additional support is provided in part by the State of Florida, Department of State, Division of Cultural Affairs and the Florida Council on Arts and Culture; Tourist Development Council and Cultural Council of Palm Beach County; and the City of Boca Raton.